First described in army ants by Schneirla (1944). A circle of army ants, each one following the ant in front, becomes locked into a circular mill. They will continue to circle each other until they all die. How crazy is that? Sometimes they escape, though. Beebe (1921) described a circular mill he witnessed in Guyana. It measured 1200 feet in circumference and had a 2.5 hour circuit time per ant. The mill persisted for two days, "with ever increasing numbers of dead bodies littering the route as exhaustion took its toll, but eventually a few workers straggled from the trail thus breaking the cycle, and the raid marched off into the forest." "A giant ant colony pumped full of cement,and then excavated reveals one of Mother Nature's marvellous wonders. We've seen what these giant ant mounds look like above ground but this is an incredible view of what the structures looks like underground - which some have called a wonder of the world." "The researchers decided to task the slime mold with a problem human designers had already tackled. They placed oat flakes (a slime mold favorite) on agar plates in a pattern that mimicked the locations of cities around Tokyo and impregnated the plates with P. polycephalum at the point representing Tokyo itself. They then watched the slime mold grow for 26 hours, creating tendrils that interconnected the food supplies. 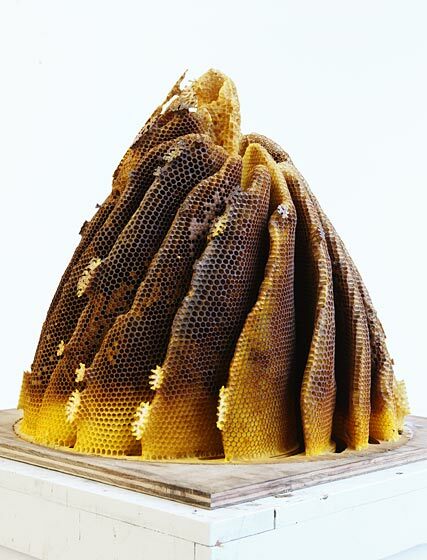 Different plates exhibited a range of solutions, but the visual similarity to the Tokyo rail system was striking in many of them"
Hilary Berseth makes sculptures with bees by placing armatures in their hives. I blogged about his work before ages ago but it has just been featured on Makezine where they've linked to this article on nymag.com which features a slideshow of images showing the process.